What can I say when it comes to gorgeous fragrances Jo Malone really have got it hands down. There is just something about the simplistic yet luxurious packaging not to mention the stunning stores/counters you can browse through. Trying to figure out the best scent for you can be overwhelming as there's a ton to choose from and it personally took me a while to get through them all. 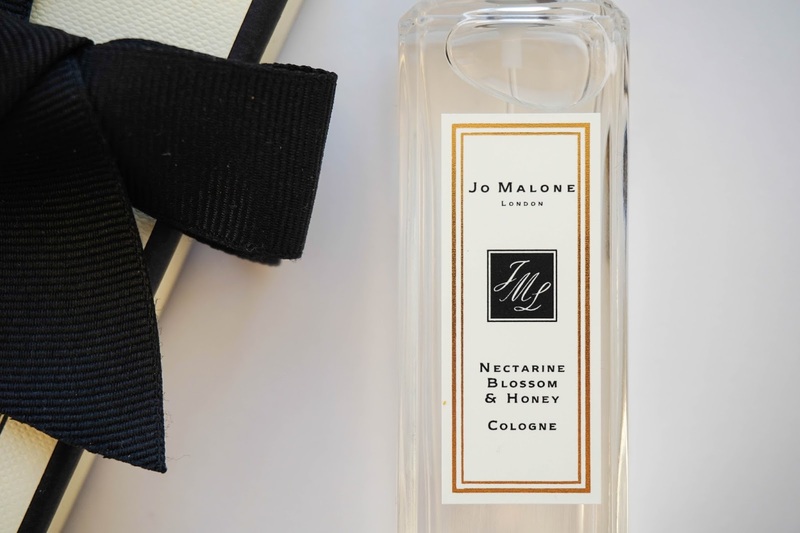 But eventually I settled for Nectarine Blossom & Honey which is probably one of the sweeter scents available, as you might already know that I love my sweet fragrances. What I love about this particular scent is that it's fruity yet floral at the same time, without the overpowering sweet smell that can feel sickly at times. There's strong notes of nectarine & peaches at first but then you soon start to distinctively smell fresh green notes too. It's these green notes that balance out the honeyed fruitiness of this cologne & I think it makes for a perfect spring/summer scent. I'm already wearing it constantly lately in the hope that spring will soon follow & the sun will start coming out to play more often. As lovely as winter is it's March & yes I'm over the cold already as I just want it to start getting warmer out. Now onto the only bad part for this stunning scent which is the price tag, this 30ml bottle may be perfect for your hand bag but not so much for your bank balance at £40. I was lucky to get my hands on this in the airport at a more affordable Duty Free price & honestly it's probably the only way I will continue to get my hands on more products from the brand in the future. I'm already lusting after some of the beautifully scented candles and luxury bath oils. So have you tried any Jo Malone fragrances? Which one is your absolute favourite? Let me know in the comments below.